Facebook asked people to rate their personal News Feeds and requested information on how they could make a Feed better for Users. Based on the feedback and how people use the News Feed they found that these three updates would improve a User’s experience. 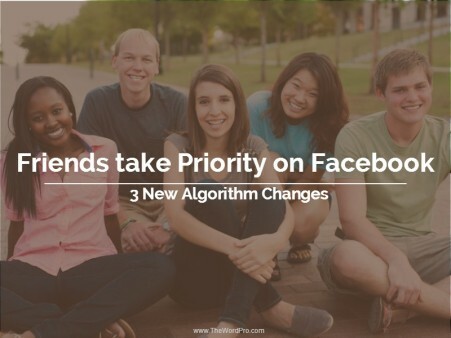 Facebook will now prioritize content posted by Users’ Friends. This ensures that content posted by Friends will be higher up in the News Feed so Users will not miss anything. Users’ expressed the importance of not missing their Friend’s updates, thus Friend’s photos, videos, status updates and links will be higher in the Feed so Users will be less likely to miss a thing. You will still be able to see content from news organizations in the Feed, but content from Friends will be a priority.